The VAC-605 is the perfect ergonomic backpack vacuum for cleaning hazadous waste in many industrial environments. The product features a 110v. motor (1.25 HP), 95 CFM, 88″ static lift, 45′ electrical cord, 2.5 gallon tank. This compact vacuum is light wieght and portable. The VAC-605 includes a vacuum hose, cervice tool, duct brush, and utility tool. 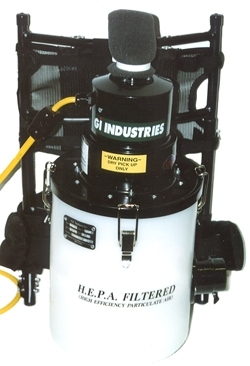 A great product for cleaning blowers, HVAC coils, industrial powders, or general maintenance. Dimension: 16" x 22" x 14"